My son’s favorite toy is a stuffed dog by Carter’s. He calls it ‘Doggie’ of course and has been very attached to it, carrying it around the house, daycare, and to restaurants and stuff. When I was 4, I had a similar “lovey” toy that I simply called, ‘Froggie’ – a green stuffed frog. One day, I dropped him into the toilet as kids often do. It wasn’t liked I’d taken a leak or anything… I’d just dropped him in there accidentally. But instead of washing it, my Mom threw it away. As you would expect, I completely lost my mind. My parents wouldn’t budge on the topic for some reason and I, even after ~40 years, asked them about it and they no longer remember the incident… but I do still to this day. Why? Because I cried and cried and cried. I did have other stuffed animals but they just weren’t the same. My parents eventually did get me a ‘green replacement’ for ‘Froggie’, which ended up being a larger green beanie stuffed turtle. It took months but I eventually warmed up to the stuffed turtle after a while, mostly because he was green too and I could more easily make the transition I guess… but I still called him ‘Froggie’. His eyes cracked and had to be replaced with those “googly Cookie Monster” eyeballs, a tear opened up on his side so the beans and stuffing leaked out which got replaced with dried table rice, it got ragged and lost a lot of the felt after having been washed (why’d they wash this toy and not the original ‘Froggie’, I’ll never know), etc. But I still have him to this day in my closet. Yes, I’m a grown man and still have my 4 year old stuffed lovey animal. As a matter of fact, I showed him to my son a week ago and introduced him as “Daddy’s version of Doggie”. He nodded. Well, when we discovered that my son took a liking to ‘Doggie’, I set out immediately to find a REPLACEMENT. 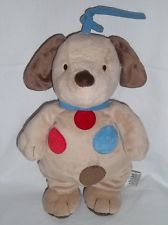 ‘Lovey’ toys are very important at that age – after all, every is centered around having a ‘Doggie’/’Froggie’ for kids. It’s a constant that exists even when Mommy or Daddy aren’t around. And all that drama in my life could have been JUST AVOIDED if there was another duplicate Froggie available. Well, just my luck, CARTER’S DISCONTINUED DOGGIE. THAT’S RIGHT. NO MORE DOGGIES ARE BEING PRODUCED. Eff that. Amazon/eBay/uBid/whatever – here we come. I scoured the Internet for aftermarket NEW & UNUSED Doggies. I don’t know if toy sales folks know what’s up with ‘Doggie’ but the prices they’re asking for are cwwwwaaaazzzy. Some wanted $50-$60 each. 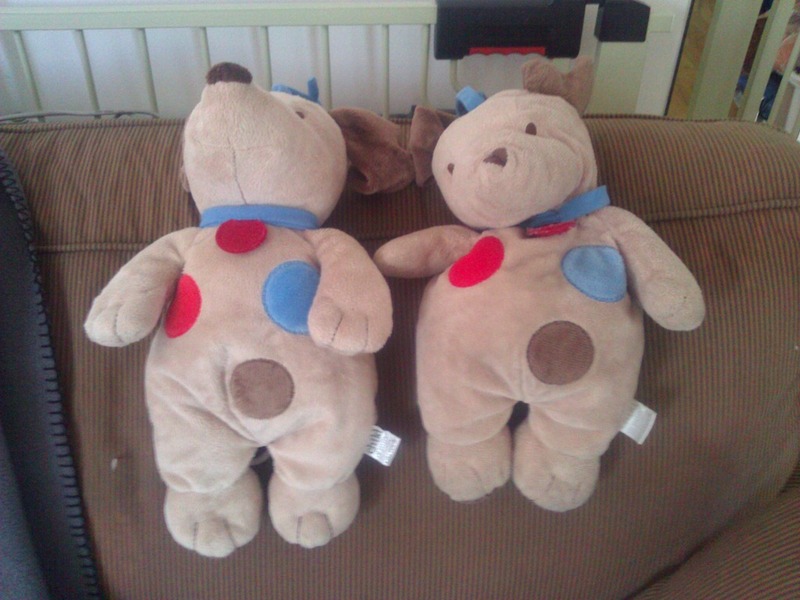 I eventually found someone willing to sell two Doggies for $35/each. You might say, “WHA?” But I say, my son’s worth it. So plop down $35 for each and have them shipped immediately. There was a lot more drama that I won’t get into here (the delivery never arrived, I had to buy a 3rd Doggie, we had an eBay dispute, etc. etc.) but the bottom line is that I eventually found myself in the possession of 3 extra Doggies. YAY! First of all, the official name for Doggie is “Carter’s Child of Mine” Tan Musical Puppy Dog or something like that. We’ll get back to that is just a second. One day, Doggie needed to be washed. Badly. The problem was that our son had to go to sleep. So, of course we go to a “backup” Doggie, figuring we’ll just swap him out and while ‘”original” Doggie’s going to the spa, “backup” Doggie will pinch hit/body double in the meantime. Big doggie. Take a look at the photo above. He’s right. The backup is on the left. 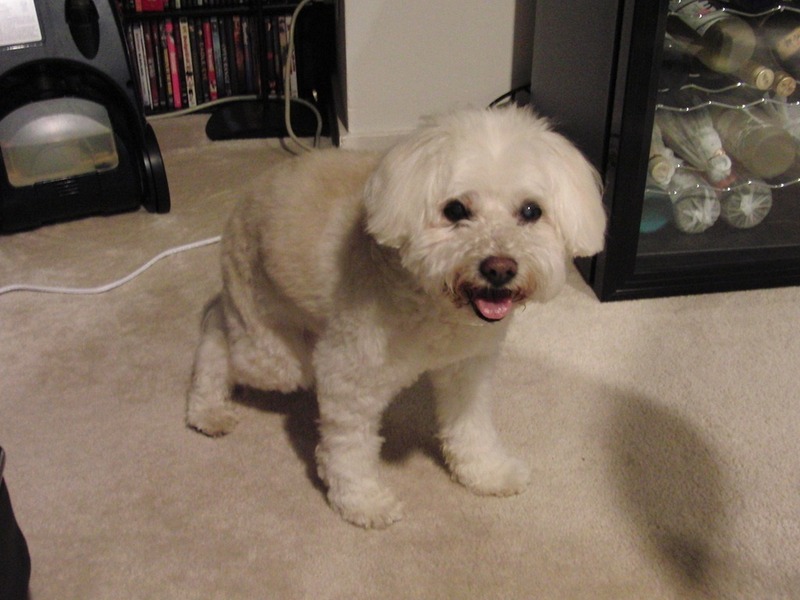 After a couple years use, “original Doggie” has gotten smaller than when we first received him and “backup” Doggie was demonstrably fatter and rounder than the original. This isn’t looking good. I’m a sales tech/engineer and I pride myself on being specific about details. This was, complete epic fail, to say the least. He looked up at me with somewhat sad eyes and said, “Beeg doggie.” I kneeled next to him and asked him if he liked Big Doggie. He looked at it, then nodded and turned around and walked away clutching “Beeeg Doggie”. He later went to bed still holding him. I later tested out all the backup Doggies. They all played “Lullaby & Good Night” instead of “Rockabye Baby”. He’s had Doggie since he was BORN so I’m not sure that backup Doggie can substitute for original Doggie but we’ll see. It beats not having a backup I suppose. Fry onion, celery, carrots, garlic in a small pad of the butter until fragrant and soft in a large pot. Do not use more than a pad here. Take all the spices (rosemary, thyme, pepper, celery seed, fennel seed, pepper flakes) and cut/crush them enough that they remain whole but are broken to more easily release flavor. Pour in broth, and mix in rosemary, thyme, pepper, celery seed, fennel seed, clam juice, pepper flakes, & tomato paste. Place cover on pot to maintain consistency. Bring to a boil, reduce heat to low, and simmer 1 hour, stirring occasionally. Stir beer into the broth mixture as well as PREVIOUS batch of Killer Shrimp and continue to simmer and occasionally stir 2 hours. Just before serving, stir in shrimp. Continue cooking 3 minutes, or until shrimp are opaque. Remove and place in serving bowl. Add remaining butter in pads. Stir until all pads are melted. 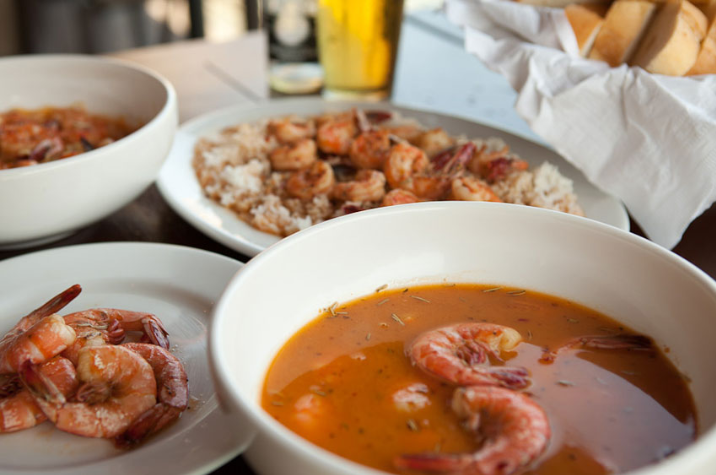 Once melted, quickly turn off heat and serve broth with previously separated shrimp in bowls. Yum. Internet wins! …Flawless victory! Kids. They remember their friends, even when they’re very young. Today, our son’s daycare teacher asked the class, “Do you have any siblings? Or pets?” Kids in the class said that they had a sister & a cat. Or two brothers. Or two dogs. Confused she asked him, “You had a dog?” and he nodded & said nothing. When my wife came to pick him up this afternoon, the teacher asked her about that, and suddenly it became clear to her what had happened. My wife came home to tell me this story during dinner. I had a hard time choking back the tears to finish my meal. We often wondered how much our son understood when Sheepa, the family dog, passed away. 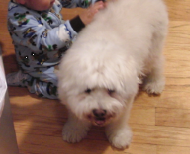 He was very gentle and was always friendly with our son, never biting him or barking at him even though my son would pull his fur or yank an ear. He’d be annoyed but for some reason, he always knew who this little person was, much like he’d know when my wife was ill. Whenever my wife would stay home in bed, Sheepa would sit or sleep next to her closely & quietly. When Sheepa had passed, I had trouble sleeping & slipped into a depression which I eventually pulled out of by focusing on the positives of Sheepa’s life. What I didn’t realize was that during the first week in particular, my son had night terrors that were probably caused by Sheepa’s passing. He would wake up screaming and be inconsolable. I kinda thought that the connection between Sheepa’s passing and our son’s sleep issues was weak… after all: How does a 2 year old understand concepts of death & ‘forever’? Later, while changing his diaper on the changing table, our son grabbed in the intercom phone on the wall. He put it to his head and said, “Hello Sheepa”, and I froze. I asked who it was on the phone and he replied, “Sheepa”. This has happened at least a dozen times now. Again, I thought it was a stretch that he did or didn’t understand the permanence of Sheepa’s departure from us. But this was… different. He actually seemed to have conversations with him specifically and only when on the intercom handset. I can only imagine what it sounded like if there was anyone downstairs listening in on our intercom conversation with our dog. So that’s why, when we heard that our son had said sadly, “He had a dog,” we knew he understood. He remembers Sheepa and knows that he’s gone. His friend no longer lurks under his seat waiting for falling food. He no longer sneaks into our son’s bedroom to patrol or say ‘hi’. And he no longer comes to the park with him to walk through the grass on sunny days. I guess that shouldn’t come as such a surprise, but I also now know he’s sad about it too. And there’s part of me that’s sort of comforted by that because I think it means Sheepa affected him in a positive way, in his own way taught him to appreciate dogs, and most of all, the value of friendship from a very young age. I know memories fade easily at this age… but I hope he remembers him. You are currently browsing the Kurt's Thoughts blog archives for June, 2012.